Oh boy, more Borderlands 2 content! Just what I need, another reason to add to the 212 hours I've spent on Pandora - and that's NOT counting the first Borderlands. 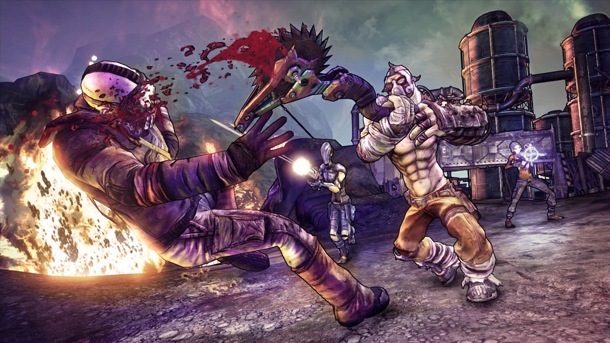 Okay, Gearbox, let's see if your hellborn, bloodlusting, maniac can tempt me back to the land of Bandits and Bullymongs. It's time to take Kreig the Psycho for a thrill kill joyride. The first thing I noticed about Krieg is that he must do a lot of crunches and maintain some pretty impressive manscaping. Wanna pull those pants up, guy? C'mon, leave a little something to the imagination. I chose one of the three standard head options and dove once more into the icy vastness of the Southern Shelf. 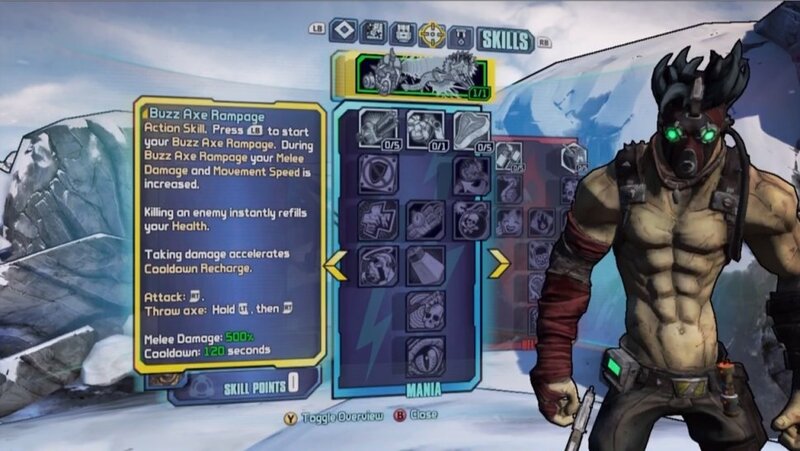 Like all other BL2 characters, Krieg starts off without the use of his action skill. He also starts off in that same damn snow area we've all played a dozen times by now. Time to boost (just a little). I'll be back int a minute. Krieg is sporting three crazy skill trees. There's not a lot of co-op specialties here, but he should be able to put on a good show. His action skill, Buzz Axe Rampage, amps up his melee damage and movement speed. He won't be able to fire a gun while the skill is active, but he will be able to whack fools with his mighty buzz axe. He can also throw this axe, which is always a good thing. On top of that, killing an enemy refills his health. It kind of reminds me of Brick's Berserk skill from the original game, with less moronic screaming. The Bloodlust tree focuses on stacking Bloodlust, naturally. All of these skills have "blood" in the title and encourage you to play aggressively, continually killing enemies in order to keep your Bloodlust up. The whole tree is capped off with the "Bloodsplosion" skill, which results in bouquets of flowers bursting from your enemies. I'm kidding. It's called a bloodsplosion for a reason. Hellborn let's you unleash your inner pyromaniac. Set enemies on fire, set yourself on fire -hell, set your breath on fire. Look at the screen funny and it will catch fire. Eventually you'll unlock the Raving Retribution skill and puke out homing fireballs, because why the hell not? The Mania tree is the most co-op-friendly skill set, and also my personal favorite. While the other paths allow for lone wolf play, Mania has more of a team player vibe. This tree is all about the Buzz Axe Rampage. Getting damaged boosts your cooldown rate, your friends can damage you (be careful!) and you can instantly revive fellow Vault Hunters. Activate your Rampage when your health is below 33% to become a Badass Psycho Mutant. Then do it again. Krieg the Psycho is available for download now on the Xbox Live Marketplace, the PSN, and PC. The going rate is $9.99 or 800 MSP. Dude is not part of the Season Pass. Page created in 0.6423 seconds.